The holidays are here, and there is no doubt that many will soon be braving holiday traffic to visit shopping centers and winter recreation in Placer County. 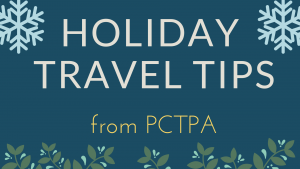 While everyone expects to be stuck in some traffic near shopping destinations this time of year, providing a smooth functioning transportation system that gets goods and people where they want to go is our focus at PCTPA, and we’re here to offer you some helpful tips! Want to avoid the hassle of driving and parking? Take public transit! Roseville Transit’s local routes provide stops at the Galleria transfer point located on Roseville Parkway between The Fountains and the Roseville Galleria. For more information on routes and fares, click here. If you have any trouble getting around the region, just call the South Placer Transit Information line – They can be reached with a 530 or 916 area code at 745-7560. Helpful staff are here to help you catch the right bus. Heading to the Bay Area for the holidays? Take the California Capitol Service and leave your car at home. Visit https://www.capitolcorridor.org/ to purchase tickets and plan your trip. Stay alert when driving. There’s a lot demanding out attention, but distracted driving is dangerous driving. Try to minimize distractions and focus on the road. Pro tip: Map out your route in advance and be prepared for busy roads during the most popular times of the year. You may have noticed the construction along Highway 65, but stores are still open for business! The Interstate 80 / Highway 65 Interchange Improvements Project is well-underway, as PCTPA and Caltrans work to ease congestion, improve traffic operations, and enhance safety in the area. We wish you a safe holiday season. Happy travels!